First and foremost, I’m so pleased to be here sharing some of my summertime reads! Thanks so much to Ginger for the opportunity. For me, summer is the best time to get some reading done. I’m a school librarian so I work far fewer hours in summer. When not at work I can most often be found sitting outside with a book in hand. Here are some of my summer essentials! 1. Sunglasses: Gotta have these to keep the glare off the page! 2. Diet Coke: Or maybe iced tea, water, or lemonade… something cool and refreshing. 3. Citronella Candle: So many pesky mosquitos! 4. Speaker: I like to have some music playing in the background… or maybe an audiobook to listen to while I paint my toenails. Nine Rules to Break When Romancing A Rake by Sarah MacLean: I have a weakness for historical romance novels! Especially any by Sarah MacLean. Keeping the Moon by Sarah Dessen: I love all her books but this one and Along for the Ride are my favorites to read in summer. My Life Next Door by Huntley Fitzpatrick: I just adored this book and want to re-read it before her next one comes out! Anna and the French Kiss by Stephanie Perkins: Do I need to explain this?!? Steph is the best! 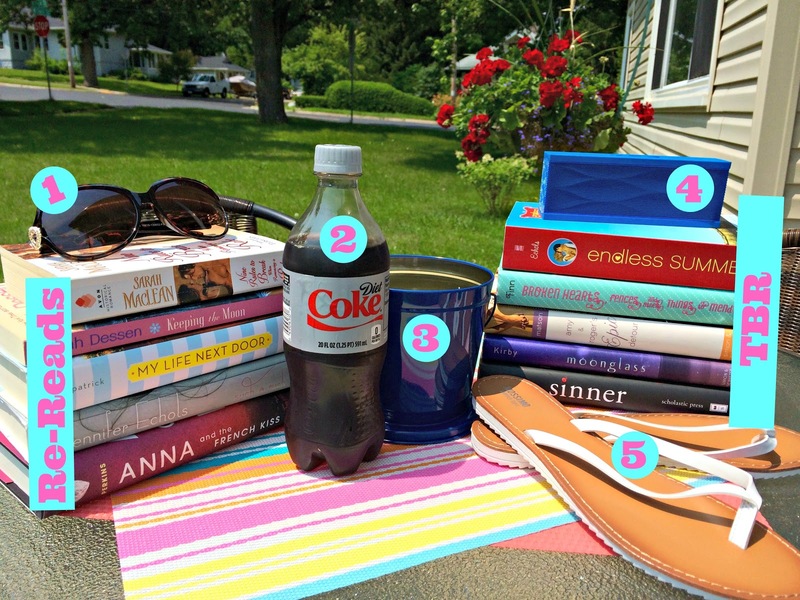 Summer TBR: There are a few books I’ve been waiting for summer to read! I can’t wait to get to these. Endless Summer by Jennifer Echols: How have I not read this one yet?!? It’s a bind up of two books and I’ve said I’m going to read it for a couple summers now. MUST get to this! Broken Hearts, Fences, and Other Things to Mend by Katie Finn: I’m so mad at myself for not reading the ARC I had of this one. Blogger fail. Amy & Roger’s Epic Detour by Morgan Matson: I read my first Morgan Matson book this year and cannot wait to read more! Everyone raves about this one. Moonglass by Melissa Kirby: Sarah Dessen blurbed it. How did I not read it?!? Sinner by Maggie Stiefvater: I’m working on finishing book series this year. I will read this one in July! Thanks again to Ginger for having me! May you all enjoy the summer sun and great books! 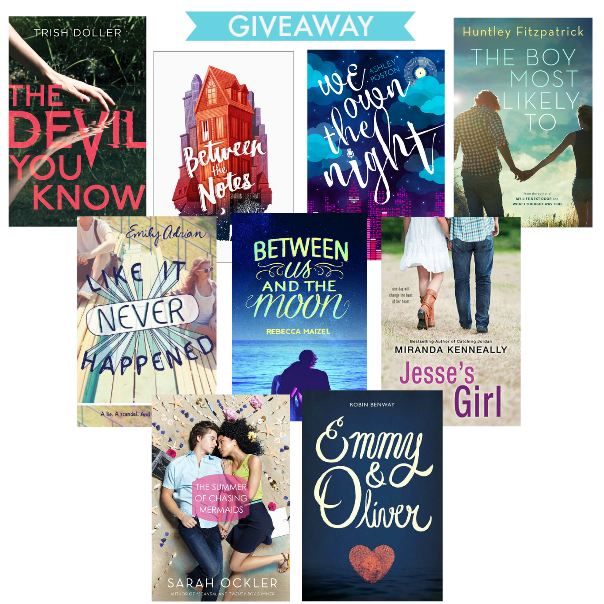 Heidi, I am so excited for your Summer TBR! Endless Summer by Jennifer Echols is one of my absolute favorite summertime reads!! You are in for a real treat :) And I can't believe you have not read Amy & Roger OR Moonglass! Oh man. Prepare for all the feels. Love your summer esstentials -- sunglasses & flip flops are a must for me, too. 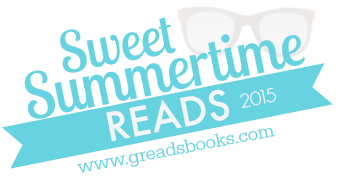 Thanks so much for sharing your Sweet Summertime Reads with us! Wow! I also have Endless Summer waiting to be read. Such a Rush is one of my favorites and Moonglass is also good. You have a nice yard. Woops... I've left comment before I enter the Giveaway. So, here's my answer for the giveaway. I live in Jakarta, Indonesia, where there are only 2 seasons: sunny and rainy season. We don't have summer holiday here, but this year, we will celebrate Idul Fitri, so I'll have a week holiday starting this Thursday. I've planned to read some books: Paper Town by John Green (have to read it before the movie comes out! ), Being Sloane Jacobs by Lauren Morril, and maybe Endless Summer by Jennifer Echols. I love spending the summer on the lake. Every summer I vacation with my family and we spend a week together at a lake in NC swimming, riding jet skis, and soaking in the sun. (I get to see some of my favorite book blogger friends then too). Like Heidi, I've reread a lot of books this summer - Where She Went, We We're Liars - to name a couple. I want to read Open Road Summer by the end of the summer. That's a goal of mine. Thanks for hosting this giveaway and I've enjoyed this fun feature! I live near the water year round and I love being next to the ocean especially in the summer. I don't frequent the beach often but I love walks a long the beach right after work or at night. I am excited to read Isla and the Happily Ever After this summer. I always gotta have my sunglasses and flip flops too. Love, love love My Life Next Door and Sinner. Happy reading! Summers where I live (Florida) seem to last a looong time. Probably not unlike Texas! But, unlike you, summer is *not* my favorite season. I always swear I was born in the wrong state. All I can say is, thank goodness for air conditioning! :) I'm reading lots of YA and NA contemporaries this summer - most currently 99 Days by Katie Cotugno. There's a couple of beautiful trails within my vicinity that I love walking on during the warm weather, yet this weather has been so hot and humid that haven't been hiking much as I'd like. Right now, I'm in the midst of reading Christopher's Diary: Echoes of Dollanganger by V.C. Andrews. Lots of summer-y essentials there! Personally, I live in England - so my essential is an umbrella!